Would like to know who made this clock and what date? Well, where to start? 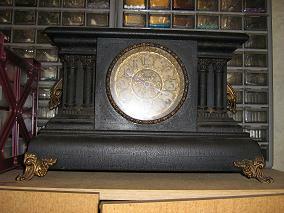 This clock is that black wood color and has twin wood pillars on both sides. It has many markings on it, some of which are very hard to see, but I have a few of them that are readable. I know the pendulum is made by Ingraham, but that is not the company that made the clock. The back where the decal is is half scratched off and very dark. I have a few of the letters of the company but could not find it under clock maker directories.